TheBunnieHole | Vancouver Youtuber & Blogger: Fashion: People Style Watch ~May! 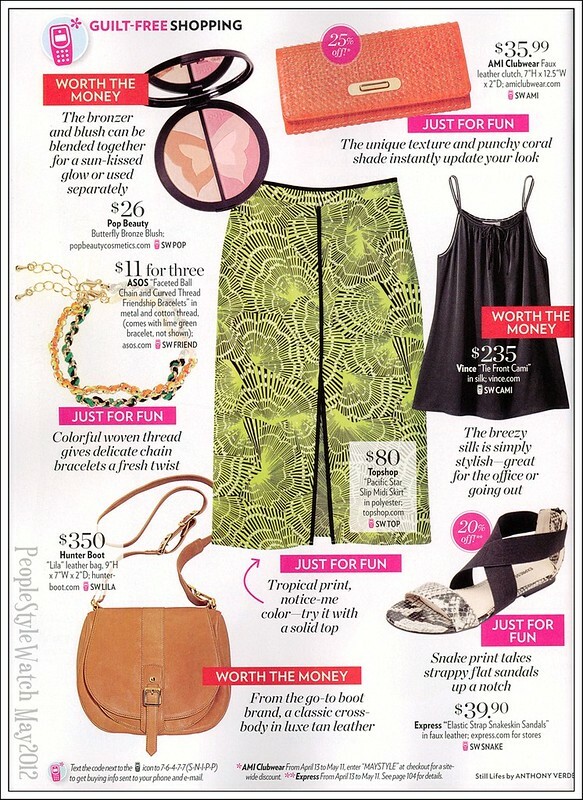 Fashion: People Style Watch ~May! If you ever browsed through my magazine shelf (yes it has it's own shelf space), you'd likely find a generous stack of Japanese VIVI, PINKY or even CanCam magazines. I love the large layout, the exploding pages of graphics and of course the styles are absolutely adorable. Although I do browse the magazine stands quite frequently when I drop by the store, I find many of them to be too stuffy, serious and unapproachable. Recently though, I've been in love with two publications in particular that breaks out of that "haute couture" aesthetic. As I've been picking up People's Style Watch quite frequently, I thought you might be interested in a sneak peak of what to add to your wardrobe. One of the first things that always struck me with this magazine was the bright and inviting layout. Not to mention the content inside was always relevant, fashion forward but interpreted in a way that would fit into a variety lifestyles. Below are a few of the pages that caught my eye. 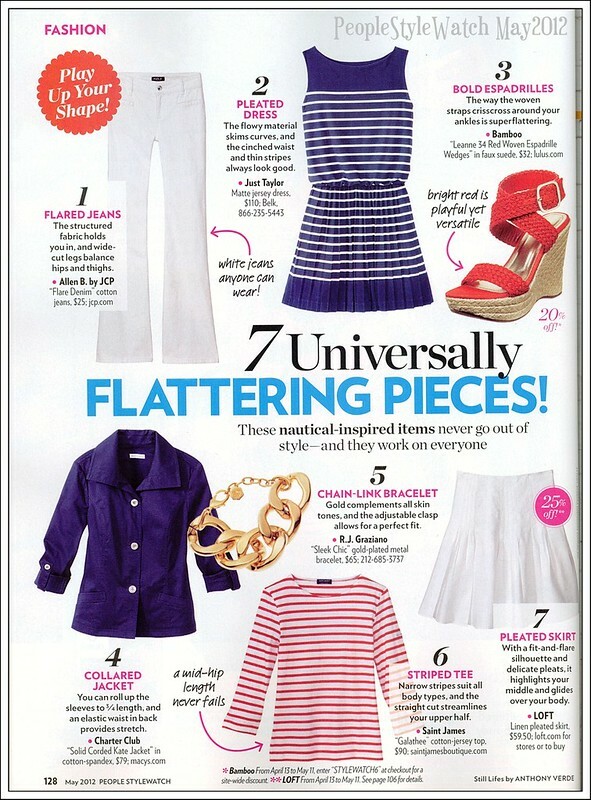 Who can say no to nautical? Especially in the spring and summer season, I love how they reinterpreted these items to be be a little less sailor but with all the detail elements still intact. 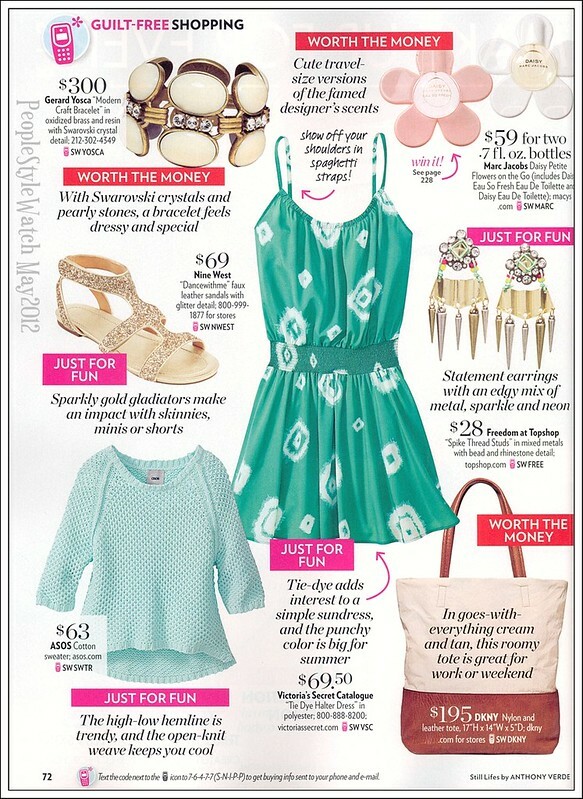 Green, mint, aqua...what ever you call it, the fresh zest of pastels are always a good choice come the warmer weather. Isn't that tie-dye sundress just the sweetest thing? I thought I'd never see the day...but tropical inspired resort style is making a huge hit this year. Anything from big flowers to green foliage is a go apparently. 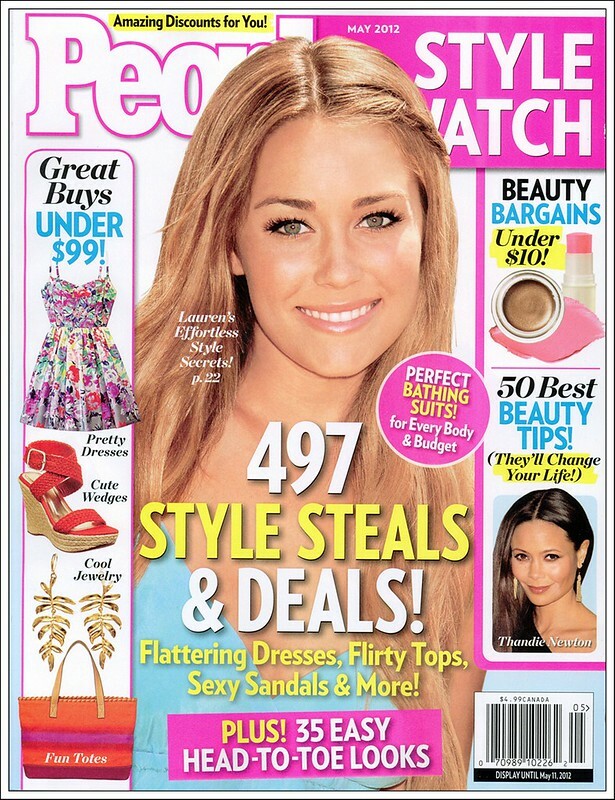 As a well rounded magazine, Style Watch always throws in a few segments on beauty as well. 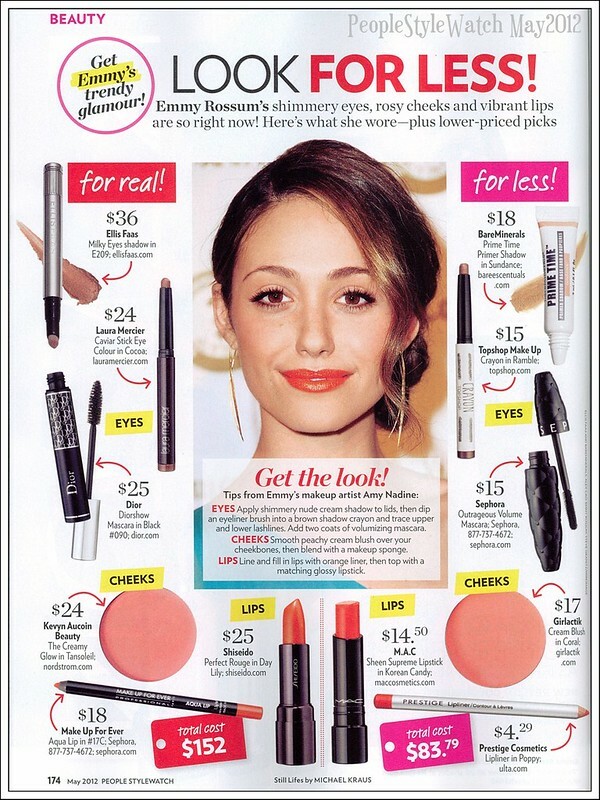 One of their popular pages is "Look for Less" which I always go to in search of inexpensive drugstore recommendations. 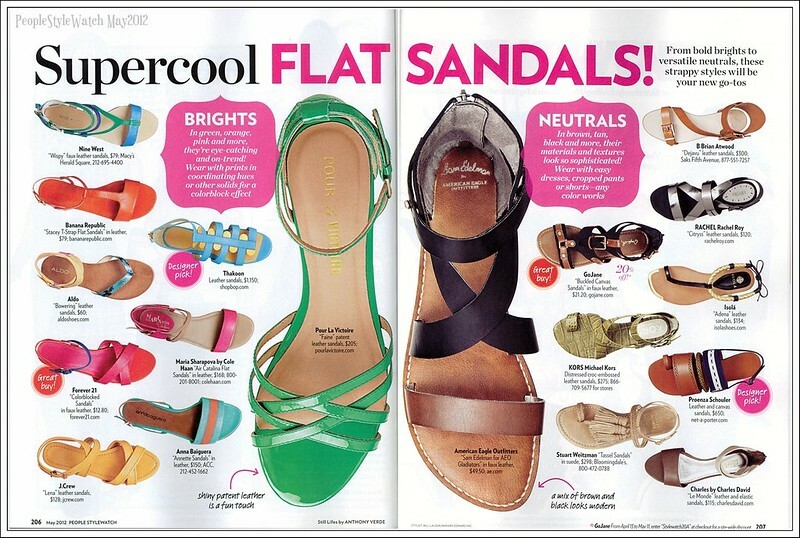 And finally, taking a big break from high heels...flat sandals are the new it trend! 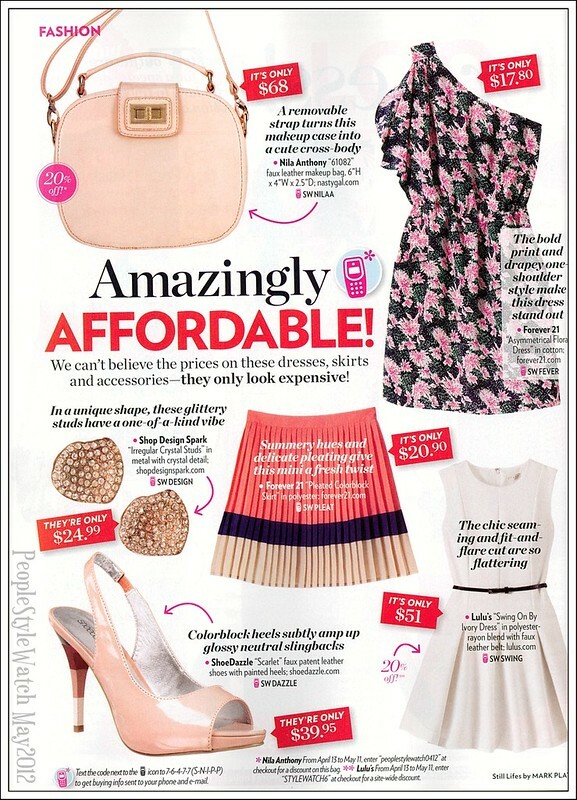 You can find this current issue of People's Style Watch until May 11th. I am considering ordering a subscription for myself, a little more expensive than others but it's so fun to read and quickly becoming a new favourite.